Leonardo da Vinci’s mural of The Last Supper, created during the 1490s, shows a clean-shaven Jesus in the middle with long hair and flowing robes. We know that spiritually, Jesus was beyond special. We also know that the manner of his conception was wondrous. But what did he actually look like in person? Does the fact he could walk on water mean that he had some unique physical attributes? A classical and very common style of depiction of Jesus that, alas, is probably totally wrong in every respect. 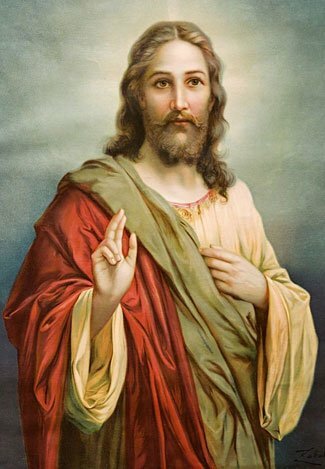 Was Jesus really a tall, slim man with long flowing hair, penetrating blue eyes with a soulful gaze, soft feminine features, and a beard? And – oh yes, a cross dresser, too (ie wearing robes associated with women of the times, according to many fanciful but ignorant depictions)? To say nothing of having a circular halo surrounding his head! That’s certainly the classic visage we’re offered in most paintings, whether modern or medieval. Sadly, one miracle Jesus never worked was to take selfies and distribute them on social media, and so we’re lacking any type of actual photographic evidence of his appearance. Furthermore, none of the artists who created some of the greatest of paintings of Jesus ever made any pretense they were basing their images on any sort of scholarly research into Jesus’ appearance. They simply tried to create what, in their mind, reflected a contemporary and appropriate (to them) impression of holiness and greatness. So what does the Bible actually tell us about his appearance and his dress-style? In short, we’re told almost nothing about his appearance at all. And sometimes, the Bible’s silence on a point is significant (like Sherlock Holmes and the case he solved because a dog did not bark). If Jesus was unusually tall (or short), would that not have been mentioned? If Jesus was very good-looking (or ugly), wouldn’t that too be praised? If he wore unusual clothing, don’t you think it would have been commented on? Instead, the Bible is silent on all such points to do with his physical appearance, and has only oblique and passing mentions of his dress and footwear. This suggests that, appearance-wise, and in the manner of his hair and dress, he looked fairly normal and average. Indeed, there are a couple of texts that positively affirm that he was unremarkable in appearance and dress, conforming to the social norms of the times – for example, when Judas Iscariot had to point him out to the Roman soldiers, which suggests that a simple description alone was insufficient, due to the similarity/nondescript nature of Jesus compared to the people around him. It is true there is a Jewish requirement for men not to cut their beard, but the observance of this seems to have started centuries after the time of Jesus. Instead, most people of the time and area where Jesus lived seemed to follow the Roman custom of short hair and being clean-shaven, or, if they lacked the time and money to be able to shave, to have short trimmed beards. Most people of his ethnic background would likely have had dark brown to black colored hair, and rather than long flowing locks, it was more likely to be tightly curled. In 1 Corinthians 11:14 Paul says that if a man wears long hair it is a disgrace to the man, which makes it further probable that Jesus had short hair. This article argues that Jesus did not have a beard. So it is likely that Jesus conformed to local norms and also had short hair and was either clean-shaven or had a trimmed beard. It is generally believed that people with the same background as Jesus had olive/darker complexions and brown eyes. For the reasons mentioned above, this description probably applies to Jesus too. 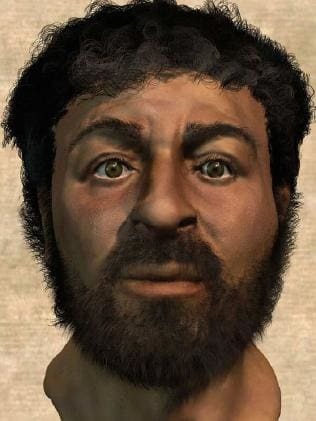 A forensic reconstruction of what Jesus could have looked like. Very different to classical images, but probably wrong about the beard. A reconstruction of a typical person with the same background as Jesus suggests his height may have been as short as 5 ft (1.5m). A more recent article study says that average heights may have been closer to 5’6″ tall (1.7m). In both cases, this is merely an expression of what the average normal height of people may have been at that time. There is no reason to think he was significantly taller or shorter than other people of his area and age. In terms of general appearance, it needs to be considered that for most of the time until he started his preaching, Jesus worked as a carpenter. This means that rather than soft skin and feminine features, Jesus is more likely to have had tough sun-burned skin, and even various cuts, scars, and possibly bone breakages (being a carpenter was a relatively risky vocation and injuries were common, according to this research). It is also likely that he was somewhere between wiry and muscular. Not only was he involved in manual labor, and walked a great deal, but it seems he was not afflicted by the sin of gluttony, so he surely did not eat in over-abundance. The Bible comments that Moses and David were both handsome. Its silence about Jesus suggests he was not unusually attractive, and it seems consistent with the concept of his assuming human form and being humble that he would not have wanted to have any special “advantages” in terms of his appearance at all. While many people greeted him as the Son of God as a result of his teachings and his deeds, no-one identified him as such due to any “god-like” features! In some respects, we know more about what Jesus wore than his appearance. The long robes Jesus is often depicted as wearing were more commonly worn by women rather than men in Biblical times. Both men and women would wear sleeved tunics, with the women wearing longer tunics typically down as far as to almost cover the feet. Men’s tunics (or chitons) were shorter, and of variable length, with working men and slaves typically having tunics going no further than the knee. Only rich men wore long tunics, and indeed, in Mark 12:38-40 Jesus even spoke against the wearing of long robes. We also know that when traveling he would have a cloak/coat/robe which people would touch the tassels of (see Mark 6:56). This was probably a tallit. One more thing. Those pure white robes? Unlikely. He probably wore colored clothing, like most common people did (they favored reds, greens and purples), and that is implied when we’re told his clothing became white after his resurrection (see Matthew 17:2 and Mark 9:3). Another source suggests his clothing may have been plain, undyed and coarsely woven. After his crucifixion, we are told his undergarment was seamless (John 19:23). The typical undergarment of the time was a shorter sleeveless tunic. This article suggests that in general he probably wore poor quality clothes, in keeping with his disavowing of material wealth and possessions. 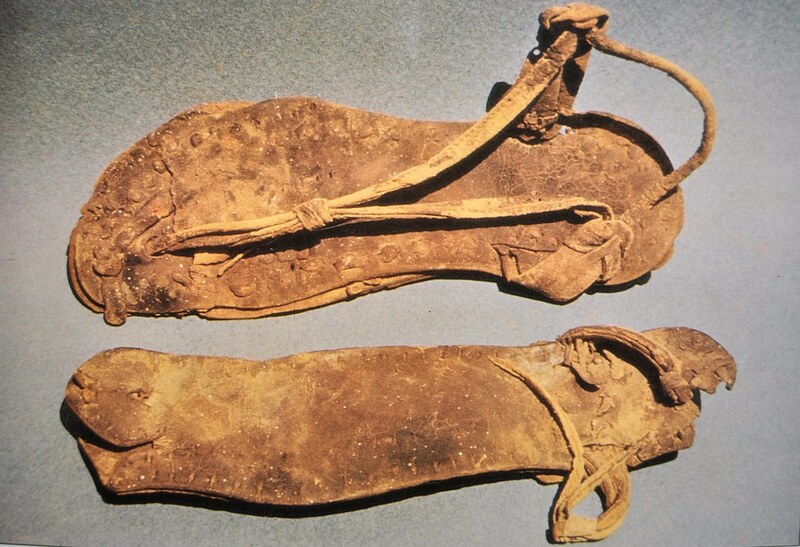 He walked in sandals, as implied in multiple Biblical passages (see Matthew 3:11; Mark 1:7 and Mark 6:9; John 1:27), and we now know what ancient Judaean sandals were like as they have been preserved in dry caves by the Dead Sea. 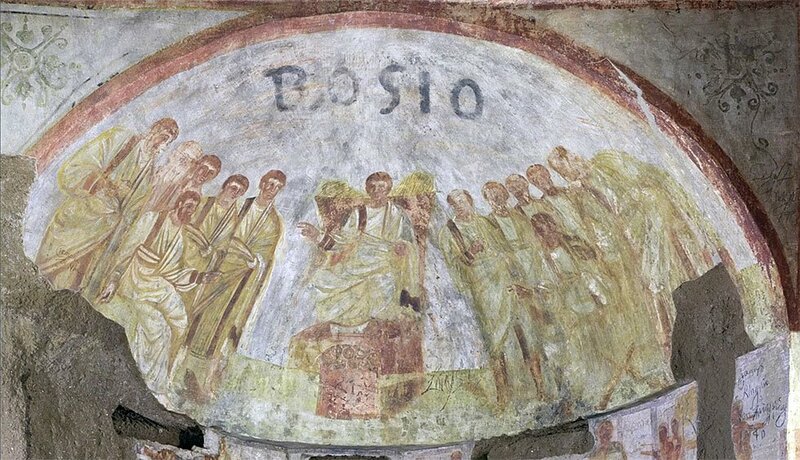 This is a picture of a fresco found in a Roman catacomb, dated to around 400 AD, and shows a picture of Jesus and presumably two groups of Apostles. While we’re uncomfortable with the long white robes everyone is wearing, note that Jesus and most of the rest of the men are clean-shaven and have short hair. Another partial image, of similar antiquity, seems to again show a Jesus with short hair and clean-shaven. Neither of these images are reliable, and we cite them merely to show that the conventional image of Jesus that started to appear in the Byzantine era and which has been perpetuated almost without change ever since represented a shift in thinking, rather than a consistent continuation of earlier images. Here is a fascinating collection of early images of Jesus to provide further indicators of how the style changed over time. Clearly, the appearance of Jesus was so unimportant and irrelevant, as part of the story of his life and teachings, that the Bible chose not to waste many words on the topic. But equally clearly, there has been a desire and even need (eg on a crucifix) to depict Jesus in his human form. It could be said there’s no harm in allowing an “idealized” expression of whatever the viewer believes to be appropriate to be used in such cases – if a visually pleasing image helps a person identify with Jesus more positively, there is probably no harm in that. On the other hand, if we know that Jesus most likely had certain physical attributes, and almost definitely did not have others, should we not also be honest about this? And recognizing the prohibitions in the Bible against worshipping idols, some church groups are at best somewhat uncomfortable with too much imagery of any form, a discomfort understandably made worse if the images are known to be incorrect. We don’t think anyone’s salvation is at risk by choosing to display and respect an idealized image that they choose to represent the human form of Jesus. After all, in his Godly form before and after his time on Earth, he is unlikely to have any human characteristics. But, in case you wondered, during his time on earth, Jesus almost certainly neither looked like nor dressed like the depictions in 99% of the pictures out there.